I go more out of my way to try and avoid trailers nowadays, especially as they seem to have evolved to the stage where the entire film is shown in them. As such the release of the fourth Insidious film took me totally by surprise. I really enjoyed Insidious, it felt like a breath of fresh air at the time, however by the time 2013's Insidious: Chapter 2 came out the series was already starting to feel stagnant. My problem was that Lin Shaye's performance as Elise was the best thing about the series, and so to have her die straight away meant there wasn't really anywhere to go. That is except backwards with Insidious: Chapter 3 actually being a prequel, but one that again felt like it was towing the line and not really doing anything to stand out. 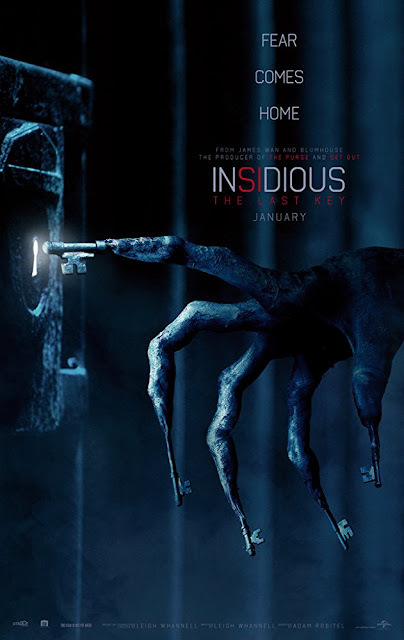 Insidious: The Last Key is another prequel, this one is shoe horned directly before the very first film and features a lot of Lin Shaye which can only be a good thing. Spirit medium Elise is contacted by a man who requests her help due to his house being haunted. This house turns out to be the childhood home she was raised in, and one in which as a child she was tricked into freeing a demonic force which proceeded to kill her mother. Returning to the place brings forth a lot of painful memories for Elise, but ones that will help her, and her lackeys: Tucker (Angus Sampson) and Specs (Leigh Whannell who also wrote this) find a way to right the wrongs of the past. Much like the previous entry I went into this with my expectations not raised very high. Initially my low expectations were met, mainly due to being very tired and not really being in the mood for a cinema visit (second day in a row!). However I came to appreciate The Last Key, mainly due to having so much Elise who still remains the most interesting character of the whole series. I liked the fact that this time around the story was very much about her, sure the plot has her responding to a request for help but it is her past that gets explored. This is done by a couple of flashbacks, one when she is a small child and first discovering her gift of seeing the dead, a second one set when she is a teenager. I liked how these flashbacks were revisited during the film shedding new light on events both in the present and in the past. The setting seemed pretty cool with her house being right next to an abandoned prison (her father was head jailer of it when she was a child), this prison itself though wasn't featured, aside from the weird ghost world that is. It was the house that was the focal point and so felt like a trick was missed in terms of horror. I found the very first film to be scary, but none of the others, that is also the case here sadly with most the scares being of the 'jump' variety that I never approve of due to their single use. There was a neat section that took place in a ventilation shaft though, the film tricks the viewer time and time again with the expectation of a jump scare that then comes from an unexpected location. I don't mind the occasional jump scare if it is well implemented, but again this likes to throw shocks lazily at the viewer for the most part. I liked the new element they use here of Elise mistaking real people for ghosts, that led to a few decent mild twists. There didn't really seem to be so much in the way of ghosts and demons this time around. The main antagonist demon is one that has keys for fingers, this was used to pretty great effect as each of the demons keys seem able to perform a different function. Of the two keys used for instance one is able to be inserted into the flesh of a human to turn off their ability to scream, while another seems able to transport the soul of the victim into the ghost realm. In terms of plot the demon here was pretty forgettable in its impact, despite the cool design, I admit to not really understanding the importance of it, or what the titles 'Last Key' bit refers to. It was more used as a cipher to explore Elise's traumatic childhood. With regards to the plot there were some unresolved plot points that slightly irritated me, but I love the way this ends with a device used that was similar to Star Wars: Rogue One of all films. This is a series that feels like it is designed to be watch in chronological order, something that is helped with the spirit realm that operates outside of time and so hints at previous and possible future instalments. The star of the show here is of course Shaye, but I will say that the usually terrible comedy duo of Tucker and Specs seem much more restrained here, they have their moments of silly moments but rarely does this occur during horror sections, it was good their zany humour didn't drown out the more serious side of things for once. All the new characters are immediately forgettable, aside from a great turn by Josh Stewart as Elise's dominating father Gerald. The child actors were also not bad at all, especially Ava Kolker as young Elise. By focusing on the character of Elise this instalment of Insidious was saved for me, becoming my second favourite in the series. However with the prequels leading directly to the events of the first film now I can't see how they can squeeze any more of this character, unless they bring her back as a ghostly main character (kind of possible seeing as how she had a bit part as a ghost in Chapter 2). Director Adam Robitel (The Taking of Deborah Logan) does a fine job here, it may not be scary at all, and it may not do much new but this is a decent enough entry if your a fan of the series.